The individual letters in the beginning of some Surahs are among those things whose knowledge Allah has kept only for Himself. This was reported by Abu Bakr,`Umar, `Uthman, `Ali and Ibn Mas`ud. It was said that these letters are the names of some of the Surahs. It was also said that they are the beginnings that Allah chose to start the Surahs of the Qur'an with. Khasif stated that Mujahid said, "The beginnings of the Surahs such as Qaf, Sad, Ta Sin Mim and Alif Lam Ra, are just some letters of the alphabet." Some linguists also stated that they are letters of the Alphabet and that Allah simply did not cite the entire alphabet of twenty-eight letters. For instance, they said, one might say, "My son recites Alif, Ba, Ta, Tha..." he means the entire alphabet although he stops before mentioning the rest of it. This opinion was mentioned by Ibn Jarir. If one removes the repetitive letters, then the number of letters mentioned at the beginning of the Surahs is fourteen: Alif, Lam, Mim, Sad, Ra, Kaf, Ha, Ya, `Ayn, Ta, Sin, Ha, Qaf, Nun. So glorious is He Who made everything subtly reflect His wisdom. The scholars did not agree on one opinion or explanation regarding this subject. Therefore, whoever thinks that one scholar's opinion is correct, he is obliged to follow it, otherwise it is better to refrain from making any judgement on this matter. Allah knows best. This is because the words that are used in speech are usually comprised of one, two, three, four, or five letters." 1.This opinion was mentioned by Ar-Razi in his Tafsir who related it to Al-Mubarrid and several other scholars. Al-Qurtubi also related this opinion to Al-Farra' and Qutrub. Az-Zamakhshari agreed with this opinion in his book, Al-Kashshaf.In addit ion, the Imam and scholar Abu Al-`Abbas Ibn Taymiyyah and our Shaykh Al-Haf iz Abu Al-Haj j aj Al-Mizzi agreed with this opinion. Al-Mizzi told me that it is also the opinion of Shaykh Al-Islam Ibn Taymiyyah. As the opening surah (Al-Fatihah) sums up in seven beautiful verses the essence of the Qur'an, so this Surah sums up in 286 verses the whole teaching of the Qur'an. It begins (verses 1-29) by classifying men into three broad categories, depending on how they receive Allah's message. This leads to the story of the creation of man, the high destiny intended for him, his fall, and the hope held out to him (verses 30-39). The story of the Children of Israel (Prophet Jacob) is then told according to their own records and traditions - what privileges they received and how they abused them (verses 40-86), thus illustrating again as by a parable the general story of man. This is the longest Surah of the Qur'an, and in it occurs the longest verse (282). The name of the Surah is from the Parable of the Heifer in verses 67-71, which illustrates the insufficiency of carping obedience. When faith is lost, people put off obedience with various excuses; even when at last they obey in the letter, they fail in the spirit, which means that they get fossilized, and their self-sufficiency prevents them from seeing that spiritually they are not alive but dead. For life is movement, activity, striving, fighting against baser things. And this is the burden of the Surah. This Surah was revealed in Madinah. 2. 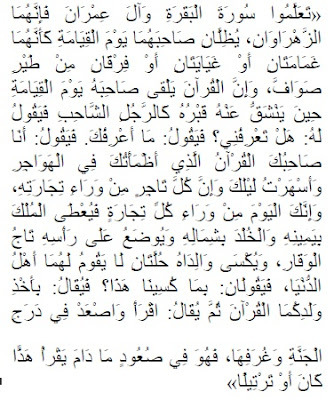 This Hadith was collected by An-Nasa'i in Al-Yawm wal-Laylah, and Al-Hakim recorded it in his Mustadrak and then said that its chain of narration is authentic, Although the Two Sahihs did not collect it. 3. Recorded by Ad-Darimi in his Musnad. 4. Recorded by Ad-Darimi in his Musnad. 5. Narrated by Ibn Mas'ud. 6. 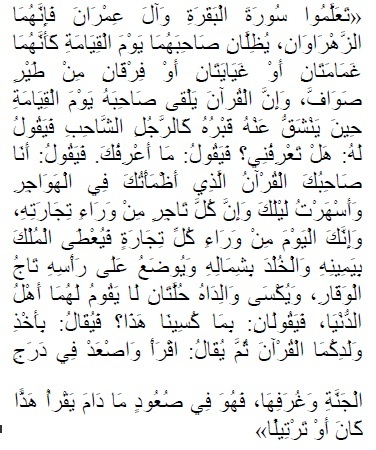 This Hadith was collected by Abu Al-Qasim At -Tabarani, Abu Hatim Ibn Hibban in his Sahih and Ibn Marduwyah. 7. Recorded by At-Tirmidhi, An-Nasa'i and Ibn Majah. 8. This is the wording collected by At -Tirmidhi who said that this Hadith is Hasan. In another narration, At-Tirmidhi recorded this same Hadith in a Mursal manner, so Allah knows best. 9. This is the narration reported by Imam Abu Ubayd Al-Qasim bin Salam in his book Fada'il Al-Qur'an. 10. Ibn Majah also recorded part of this Hadith from Bishr bin Al-Muhajir, and this chain of narrators is Hasan, according to the criteria of Imam Muslim. 11. Also, Imam Muslim narrated this Hadith in the Book of Prayer. 12. It was also recorded in Sahih Muslim and At -Tirmidhi narrated this Hadith, which he rendered Hasan Gharib.